Baked ham is a popular food during festive season and gathering. 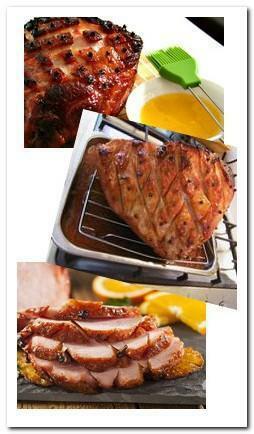 The tips for a delicious baked ham is to keep the meat remain juicy and season with good glaze. It might take hours to bake a ham, but the ingredients and preparations always simple and hassle free. Understand the hams you are purchasing, it is always different methods of cooking and to store them. Preheat oven to 160°C. Grease a roasting pan or line a piece of aluminum foil. Score the ham, making diamond shapes and place the ham in the roasting pan. Cover the ham with aluminum foil. This keeps ham from burning or dry out. While the ham is baking, prepare the glaze. Add butter, honey, brown sugar, orange juice and mustard in a saucepan. Cook with low heat, stir until butter and brown sugar dissolved and everything is mixed together well. Set aside. After 1 hour and 30 minutes, remove ham from oven. Remove aluminum foil, brush the ham with glaze. Return the ham to oven, brush the ham with glaze every 10 minutes until done. Remove from oven, rest for 20 minutes before carving and serve.